The club plans a number of official trips throughout the year. 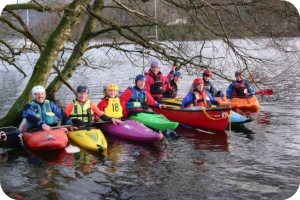 These are not instructed trips for beginners but offer a variety of levels for paddlers with suitable skills and experience. They will be advertised as club trips and led by a competent paddler. The participant will need to have their own equipment as the club has no outdoor gear. The trips will take place in a variety of locations from lakes, local sea trips or on one of the many great rivers around the area. Dates and arrangements for club trips will be posted on the forum. Informal trips are also organised between members through the forum. These unofficial trips are not safety checked by the club and those taking part need to assess if the trip is suitable for their skill level and how the trip will be organised. If you are unsure stick to official club trips! Find out more and sign-up for trips on the club’s calendar.